From left|! !| Globe Manufacturing Company co-owners Don Welch|! !| who’s also the firm’s CEO|! 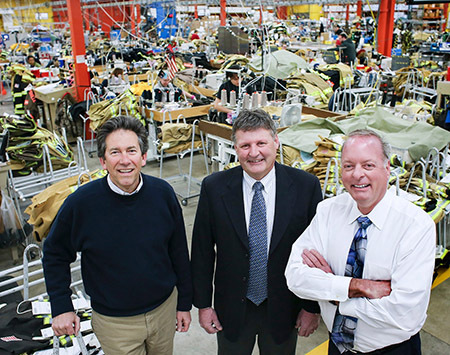 !| George E. ‘Gef’ Freese III and Rob Freese on the firm’s factory floor earlier this year. The firm is being acquired for $215 million by MSA Safety Inc. of Pittsburgh. MSA Safety Inc.’s $215 million acquisition of Pittsfield-based Globe Manufacturing Company – announced Wednesday – could result in “major opportunities for growth,” said Globe CEO Don Welch. That’s because, unlike many mergers, there is “virtually no product overlap,” said William Lambert, chairman and CEO of MSA, a publicly traded protective equipment firm based in Pittsburgh, Pa., with $1.15 billion in revenue. Globe has manufactured safety clothing and boots primarily for firefighters since 1887. MSA, which got its start in the coal industry as Mine Safety Appliances in 1914, makes respirators and helmets and other equipment – like thermal imaging equipment – for a wide range of industries, including firefighting. “This way we could clad them from head to toe,” said Welch. Globe will keep its name, because it is so well known in the firefighting field, but the merger could mean the development and adaptation of Globe products for other fields served by MSA, including the gas, oil, construction and mining industries, as well as the military. Already Globe has developed athletic-inspired turnout gear that features lightweight fabric allowing for greater motion and flexibility that might be attractive to other industries. The merger could result in a geographical expansion as well. Despite its name, Globe exports less than 5 percent of its product and MSA exports half. Globe has over 420 employees, with 320 in Pittsfield, 55 in Auburn, Maine, another 50 in Oklahoma and Virginia, and none are overseas. MSA has 4,300 employees and has manufacturing operations in Europe, Asia and Latin America. MSA could literally open up Globe to the rest of the world. Welch said there are no plans to shut down or consolidate U.S. operations. 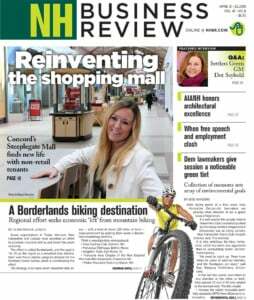 The expectation, he said, is that the result will be expanded production and research and development in New Hampshire. That’s why Welch approached MSA about five months ago, he said. “We were thinking about the future of this business,” Welch said. The merger didn’t make sense just because of the product synergies but because of “shared values” when it comes to “ethics and integrity” in the treatment of both companies’ employees. The $215 million price tag, is about twice Globe’s revenue, said MSA in its release, and nine times its profit. The all-cash transaction – financed with borrowings of less than 2 percent – will add to the company’s earnings per share in the first year. The money would go to Globe’s owners, which include Welch, two other principals, George E. Freese, III and Robert A. Freese, and undisclosed shareholders. Welch declined to reveal his ownership share, but he said he expects to stay on with the company at least during the transition. Last year, MSA amassed a profit of $92 million, or $2.45 a share, about $11 million more than the previous year. In the first quarter of 2017, revenue was down by 5 percent to $266 million but quarterly profits were up by $4 million to $22 million, or 58 cents a share. The company reported $1.26 billion in assets at the end of last quarter, with $104 million in cash – thus the borrowing necessary for the purchase – but about half of that is in liabilities leaving shareholder equity of $578 million in shareholder equity. Some of those liabilities includes $9.2 million set aside for liabilities claims for some 1,572 lawsuits, mostly related to chronic disease of coal miners using MSA equipment years ago. MSA paid out $151 million in such claims over the last three years, with more than 460 suits settled in the last year. Most of that money came from insurance companies, but at times, MSA has had to sue some of those companies. Meanwhile, the company’s five top executives earned $10.6 million in compensation last year, with Lambert getting paid $4.7 million. The deal is expected to close in 30 days, after a waiting period dictated by the federal government. MSA shares closed at $83.37 on Wednesday, a 4.57 percent gain.